Nestled along the finest beaches throughout Mexico, the Dominican Republic, Costa Rica and Panama, Dreams Resorts & Spas offer every amenity you'd expect from a world-class destination. 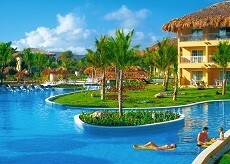 Swim with the dolphins, play a round of golf or just lay out by the pool. Stay in one of 391 gorgeous rooms, all equipped with ocean or garden views. Guests who are Preferred Club members can also enjoy perks like a private beach area and lounge, upgraded minibar service and bath amenities, concierge service, and more. When it comes to gourmet cuisine, Dreams Dominicus La Romana certainly wont disappoint. Choose from eight tempting restaurants, including Pan-Asian, Italian, French, and international specialties. Not in the mood for a large meal? Not to worry! Pizza and snacks are available whenever you need something to satisfy your hunger. On top of that, 24-hour room service is always available for the days when you simply dont want to leave the comfort of your room. Dont forget the Sip, Savor & See dining experience, which allows you access to nearby participating resorts to dine, drink, and view exceptional entertainment! Whether you choose to visit the Dreams Spa by Pevonia®, with its indulgent treatments and full-service salon, or take advantage of all of the exciting activities and events that the resort has to offer for children, teens, and adults, youll never experience a dull moment at Dreams Dominicus La Romana! Dreams Huatulco Resort & Spa, perfectly placed on Tangolunda Bay, one of the largest and most beautiful bays, is a sanctuary of both leisure and adventure for families, couples, singles, and friends. Enjoy endless day and night activities and all the privileges of Unlimited-Luxury where everything is included. All rooms and suites boast amazing views, elegant design, and comfort. Amenities include a private terrace, satellite TV, DVD player, complimentary daily refreshed mini bar with soft drinks, juices, bottled water, and beer, 24-hour room service, and other lavish luxuries. Upgrade to a Preferred Club room and receive exceptional services and world-class amenities. 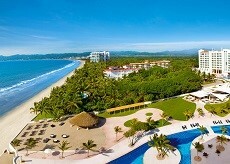 Pristine pools, oceanfront Jacuzzis, and numerous land and water activities leave nothing to be desired. Kids love their time spent at the fun-filled, supervised Explorer's Club. Relax and rejuvenate in the Dreams Spa by Pevonia, complete with state-of-the-art treatment rooms, oceanfront cabins, fitness center, and a beauty salon. Dining options include six international gourmet venues and six friendly lounges, all serving unlimited premium beverages. Evenings will bring live shows, parties, and dancing. Enjoy a spectacular array of day and evening activities with adventures for every age and interest. There are three swimming pools, two with swim-up bars, a full-service spa, state-of-the-art fitness center, Explorer's Club for kids, gourmet à la carte restaurants , gourmet à la carte restaurants that offer vegetarian and gluten-free options, lounges, and more. The friendly, fastidious staff will make you feel like the honored guest that you are. Nearby, eight championship golf courses are designed by Jack Nicklaus, Roy Dye, Tom Weiskopf, and Robert Trent Jones Jr., to name a few. You are close to the quaint art shops, restaurants, and nightlife, and some of the world's best marlin fishing. A few minutes north is the 18th century atmosphere of San Jose del Cabo, a charming and picturesque mission town. 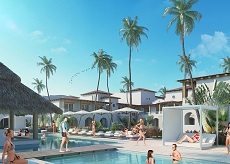 On a sun-drenched, palm-studded beach on the east coast of the Dominican Republic, Dreams Palm Beach Punta Cana welcomes singles, couples, and families to a world of Unlimited-Luxury® with everything included. 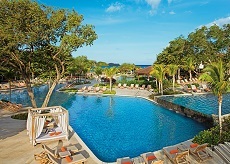 This idyllic resort boasts gorgeous beaches, a majestic turquoise sea, three shimmering pools, and tropical gardens. Eight internationally themed restaurants and five bars, located in stunning indoor and outdoor settings provide delectable gourmet dining options. With Unlimited-Luxury®, guests have the option to Sip, Savor & See. This includes complimentary dinner and drinks and live evening entertainment at nearby participating resorts from 6 p.m. to 1 a.m. (transportation costs are not included). Pamper yourself with a variety of unique indigenous treatments at the world-class spa, or get your heart rate going at the state-of-the-art fitness center. With so many ways to play, from numerous daytime activities, featuring an Explorer's Club for kids and a Core Zone for teens, and fantastic nighttime entertainment, a stay at Dreams Palm Beach will be forever memorable. Elegantly-appointed rooms and suites offer luxury amenities, private and furnished balconies or terraces, flat screen TVs, daily refreshed mini bars with soft drinks, juices, bottled water, and beer, and 24-hour room and concierge services. Upgrade to a Preferred Club suite and receive exceptional services and world-class amenities that include preferred status and amenities. Dreams Puerto Aventuras Resort & Spa welcomes you with crystalline pools, hideaway beach spots and the shade of palms and thatched palapas. Watersports, swimming with the dolphins and manatees at the on-site dolphinarium, bike tours, and beach combing are favorite activities here. Choose among six restaurants offering sumptuous à la carte dining and five exquisite bars and lounges. Guests have the option to Sip, Savor & See as part of the privileges of Unlimited-Luxury. Enjoy complimentary dinner and drinks and live evening entertainment at nearby participating resorts from 6pm to 1am (transportation costs not included). 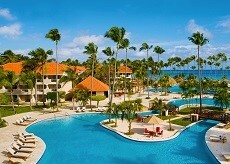 Secluded in a lush tropical paradise that faces a pristine beach with blue waters stretching to the horizon, Dreams Punta Cana Resort & Spa offers a stunning ocean view from the majority of guest accommodations. This opulent resort offers Unlimited-Luxury® beginning with a free form swimming pool which winds its way from the lobby down to the beach and is complete with waterfalls, a swim-up bar and venues throughout. Indulge in six à la carte themed restaurants, and ten stylish bars and lounges. With Unlimited-Luxury®, guests have the option to Sip, Savor & See. This includes complimentary dinner and drinks and live evening entertainment at nearby participating resorts from 6 p.m. to 1 a.m. (transportation costs are not included). Live nightly shows compliment the vast array of daily activities from kayaking and snorkeling to unwinding at the lavish spa. The Explorer's Club for kids, a fully supervised children's program for ages 3-12, features weekly campout adventures, sand castle competitions, a rock climbing wall and a pirate ship waterslide. For romantics, the stunning wedding gazebo is the perfect place to say I do. All accommodations are luxuriously spacious, airy and bright, with room for everyone to truly relax. If you desire an even higher level of luxury, the Preferred Club is for you. Enjoy an upgraded suite, special concierge service and Preferred status and amenities. 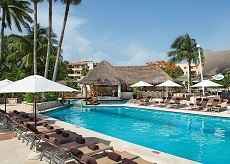 The luxurious Dreams Riviera Cancun takes its personality from its incredible location - just 30 minutes from the "hot" excitement of Cancun, yet right on the "cool" Caribbean close to Playa del Carmen and many other of the Mayan Riviera's most sought-after sights. This enchanting wonderland welcomes families, couples, singles, and friends to enjoy all the pleasures and privileges of Unlimited-Luxury. When the sun goes down, Dreams Riviera Cancun heats up. Meet new people from around the world. Share stories about your remarkable day then get ready for another whole new world the next. Enjoy moonlit theme parties and dancing, spectacular live music and shows, Desires nightclub plus other great evening bars, movies on the beach, stargazing, and other festive happenings every evening. The supervised Explorer's Club keeps your kids totally entertained with exciting games, adventure, and exploration from 9 a.m. to 10 p.m.
"Home" will be your uniquely shaped octagonal room or suite, beautifully appointed with a private balcony, marble floors, and full marble bath area with Jacuzzi tub and dozens of other luxury amenities and conveniences. Upgrade to the Preferred Club to enjoy VIP status and amenities. A great vacation requires great meals. Your Unlimited-Luxury experience means unlimited gourmet dining and premium brand beverages. Nine internationally specialized restaurants serve luscious fare in stunning outdoor and indoor settings. No reservations, wristbands, or coupons are required. As part of the privileges of Unlimited-Luxury, guests have the option to Sip, Savor & See. Enjoy complimentary dinner and drinks and live evening entertainment at nearby participating resorts from 6 p.m. to 1 a.m. (transportation costs are not included). Guests of all ages will find fun and excitement at Dreams Sands Cancun Resort & Spa. Ideally located on the white sand beach in Cancun's Hotel Zone, this family-friendly beachfront resort is within a short walk from great shopping, restaurants, and bars, and just fifteen minutes from downtown Cancun. Dreams Sands Cancun Resort & Spa offers all the activities, excitement, and entertainment your family needs to unwind and let loose on your beach vacation. With Unlimited-Luxury, guests enjoy complimentary non-stop transfers, unlimited gourmet dining and top-shelf liquor, no wristbands, and no reservations! 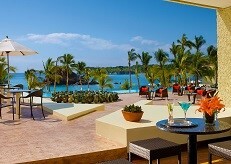 Retreat to your room or suite with stunning views of the Caribbean Sea and Isla Mujeres. If you're truly looking to be pampered, upgrade to the Preferred Club for a private lounge with continental breakfast and afternoon hors d'oeuvres, upgraded mini-bar service, and preferred status and amenities. 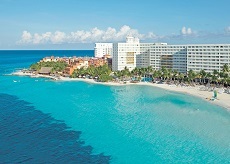 Dreams Sands Cancun Resort & Spa offers unlimited dining at seven fabulous restaurants. Try out the international buffet at World Cafe, or elegant Italian cuisine at Portofino. For Pan-Asian specialties visit Himitsu, or enjoy sophisticated French cuisine at Bordeaux. During the day, take a break from the waves with snacks and a barbecue by the beach at Barefoot Grill, or get a second wind with coffee, tea, and deli snacks at Coco Cafe. 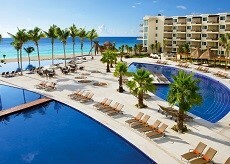 Activities abound at Dreams Sands Cancun Resort & Spa. Relax in the Spa by Pevonia, play a round of golf at Playa Mujeres Golf Club, or try out a variety of watersports including kayaks and scuba diving (fee). Children will have fun all day long at the Explorer's Club (ages 3-12), where they enjoy supervised activities such as arts and crafts, water activities, and campout adventures. 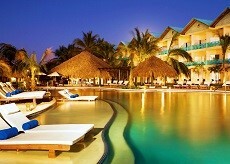 Dreams Tulum Resort & Spa sits on two miles of powdery white sand and boasts activities for the whole family! The Caribbean Sea is perfect for snorkeling, catamarans, windsurfing, kayaking, and jumping on the ocean trampoline. Dreams Spa by Pevonia offers a full range of natural curative massage therapies and facial treatments; each designed to soothe your body, mind, and spirit. And to really help you unwind, the Explorer's Club keeps kids happy and busy with their own kind of supervised fun. Choose from magnificent dining options featuring six à la carte and one buffet-style restaurant. Dine at the Seaside Grill, an à la carte steak house, enjoy French cuisine in a romantic setting at Bordeaux or visit El Patio for Mexican fare. Seven bars, including pool and beachside, are perfect places to make new friends. As part of Unlimited-Luxury, guests have the option to Sip, Savor & See. Enjoy complimentary dinner and drinks and live evening entertainment at nearby participating resorts from 6pm to 1am. (transportation costs are not included). Guests are able to enjoy up to one round of complimentary greens fees at the Riviera Maya Golf Club, a Robert Trent Jones II designed golf course per person, per day as part of their Unlimited-Luxury experience (subject to availability/restrictions apply). 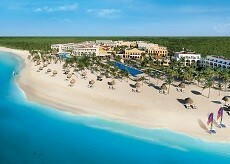 Guests will have access to the complimentary on-course food and beverage service provided at The Riviera Maya Golf Club. 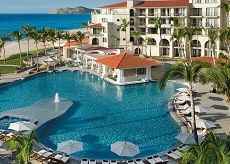 Dreams Villamagna Nuevo Vallarta treats couples and families to Unlimited Luxury®, with spectacular views of Banderas Bay, the Sierra Madre Mountains, a gorgeous beach, and elegant pools. Located only 20 minutes away from the historic colonial town of Puerto Vallarta, whale watching, fantastic golfing, shopping, and nightlife are nearby. The all-suite, 10-story luxury towers feature private balconies or terraces with private Jacuzzi, satellite TV, DVD player, complimentary daily refreshed mini bar with soft drinks, juices, bottled water, and beer, and 24-hour room service. Upgrade to a Preferred Club room and receive exceptional services and world class amenities. Five international restaurants and five charming lounges will tempt guests with exquisite gourmet fare and unlimited premium beverages. Dreams Spa by Pevonia at Dreams Villamagna offers a sublime atmosphere of pure indulgence that combines hydrotherapy and indigenous treatments, creating a refreshing, invigorating, and peaceful experience. A large shimmering pool, a fabulous beach, and more day and evening activities than can be counted, are among many options to entertain. Enjoy complimentary dinner and drinks and live evening entertainment at nearby participating resorts from 6p to 1a (transportation costs are not included). Play the day away in shimmering pools and sparkling seas. Choose from dozens of leisure sports activities for every age and interest. After a fun-filled day at Dreams Villamagna, there is still plenty to do. Enjoy spectacular live entertainment, dance the night away, or simply unwind on your private balcony while enjoying room service and a cocktail. Call your Vacation Specialist at 757-890-1171 TODAY!